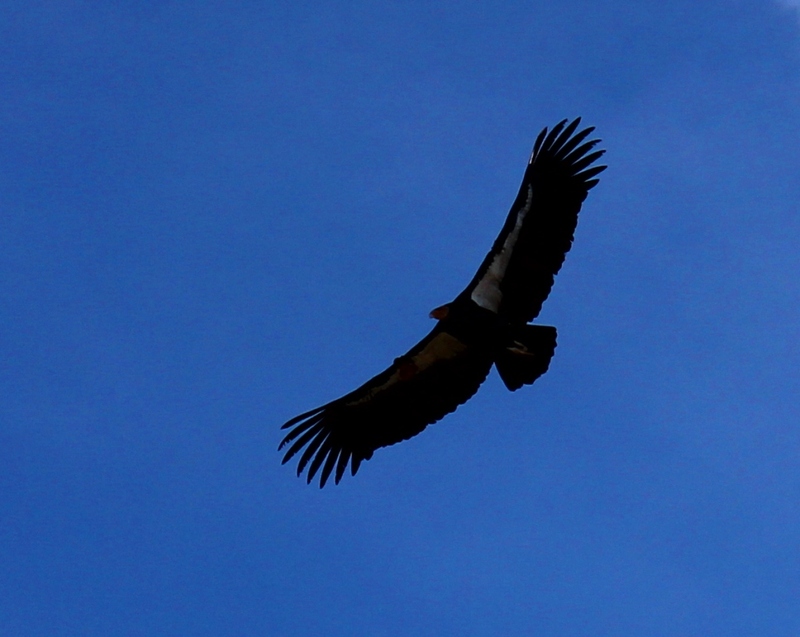 California condor soaring over Whiteacre Peak. 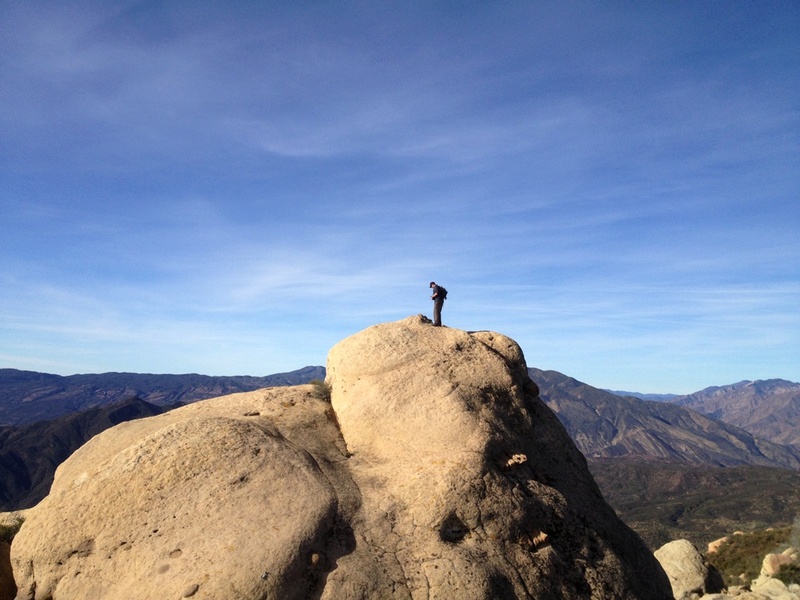 Stillman (DavidStillman.blogspot.com) had a good idea, which by the end of our day turned out to be an excellent idea, to find a route to the summit of Whiteacre Peak in the Sespe Wilderness. 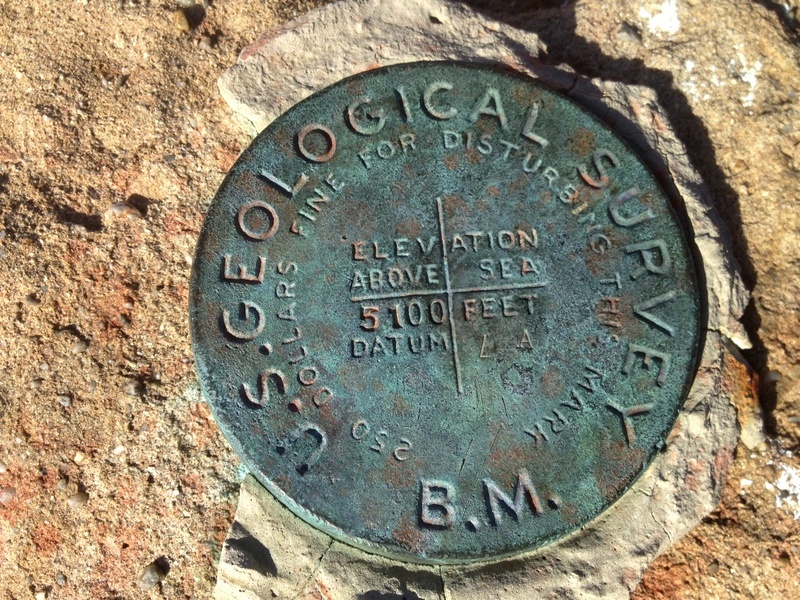 It’s a “Seldom Visited Site,” as it’s called among backcountry hikers and the current summit register, started in 2002, reflects this unofficial status. The last person to sign-in did so in 2007. 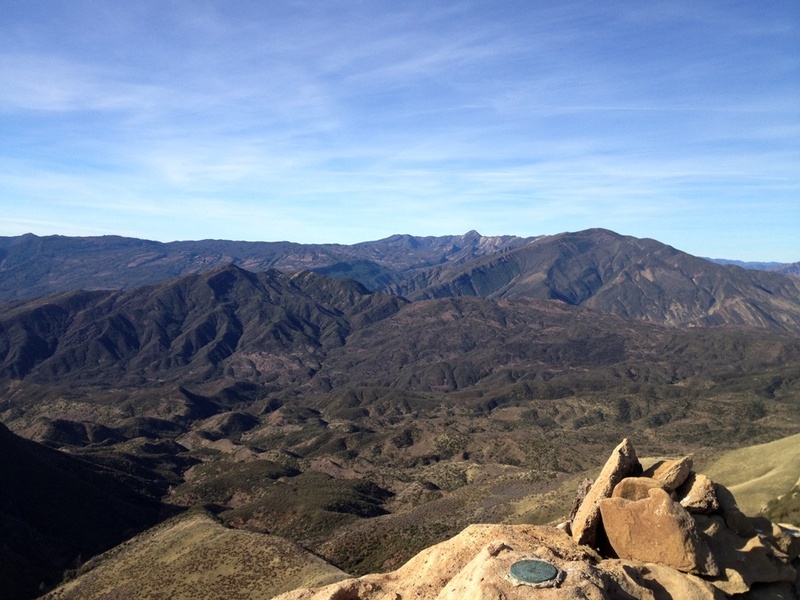 Whiteacre Peak rises to the east of, and overlooks, the Dough Flat Trailhead which provides access into the Sespe Wilderness and from which we started our hike. 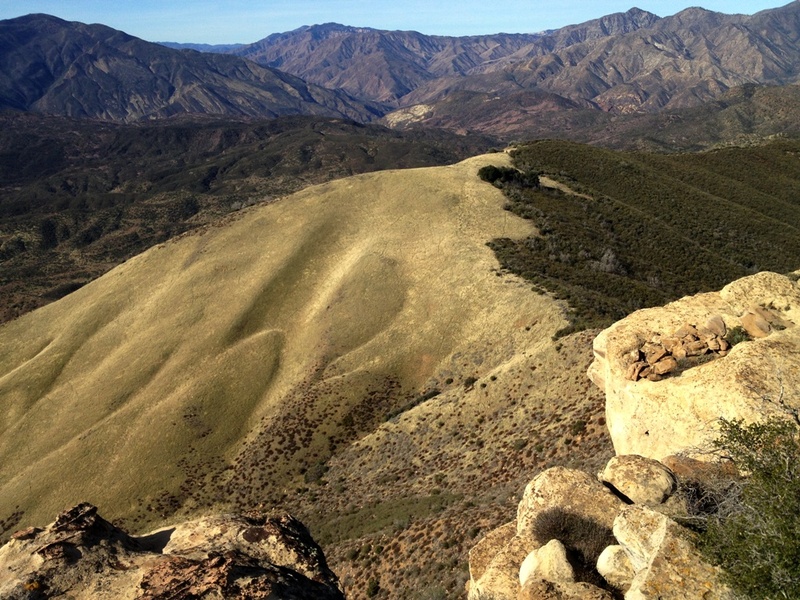 While we passed numerous cairns along portions of the chosen route, once off the official Sespe Trail there is no trail. There is only well-tramped animal paths to follow separated by dense chaparral. We were following the many footprints of deer, bobcats and mountain lions that had been left following the recent rain. The route plotted by Stillman made for an exceptional day hike. It comprised a sprinkling of all the herbs and spices that make for a recipe of challenging, but fun hiking. We started on the Sespe Trail, left that wide open pathway and walked one of the low ridges that spread like fingers off the base of Whiteacre Mountain, climbed up a steep and lengthy 45 degree grassy slope, trod across more chaparral covered ridgeline, through a grassy potrero, threaded our way through a steep rocky slot which included a few feet of rope climbing and crawling on hands and knees through a brush tunnel, across sandstone bedrock slabs and boulders while busting through sections of dense chaparral, down through a deep cleft between the bedrock formations just beside and below the peak, and then on up the rock slabs to the summit. It was an interesting hodgepodge of landscape features that kept us well entertained. On our ascent Stillman spotted a mountain lion print in the sandy dirt amid the rocks near the rope section through the steep rocky slot. On our way back we noticed lion prints in several locations as they followed the ridgeline. It’s quintessential lion territory up there. 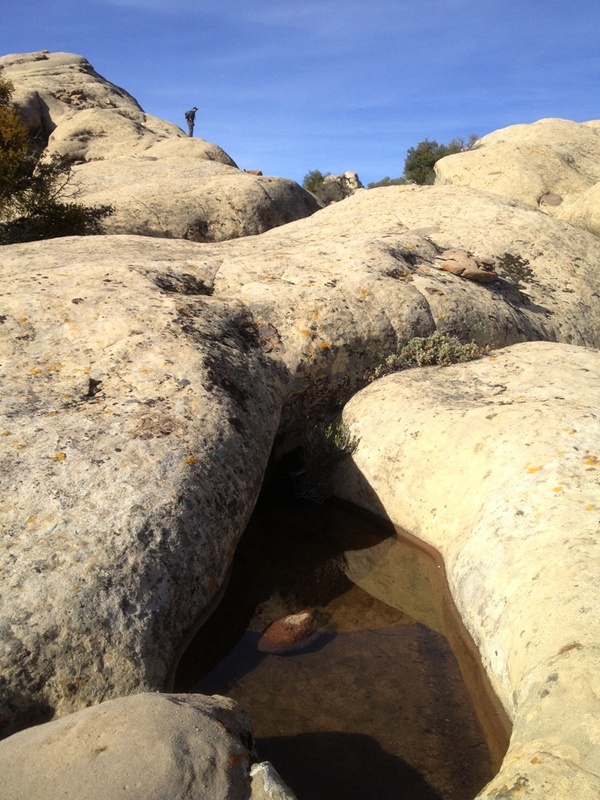 Atop the mountain bedrock slabs form eye-catching terrain that’s fun to explore with caves, small flat grassy pockets, water seeping down rock faces and several depressions in the stone filled with rain water. Together the features combine to form, aside from an aesthetically pleasing environment, a rather hospitable place for wildlife. It’s remote, seldom visited by humans, and water is seasonally available. Having left Whiteacre summit we sauntered back down the rocks and picked around checking the place out for a bit. Stillman went his way, I went mine. 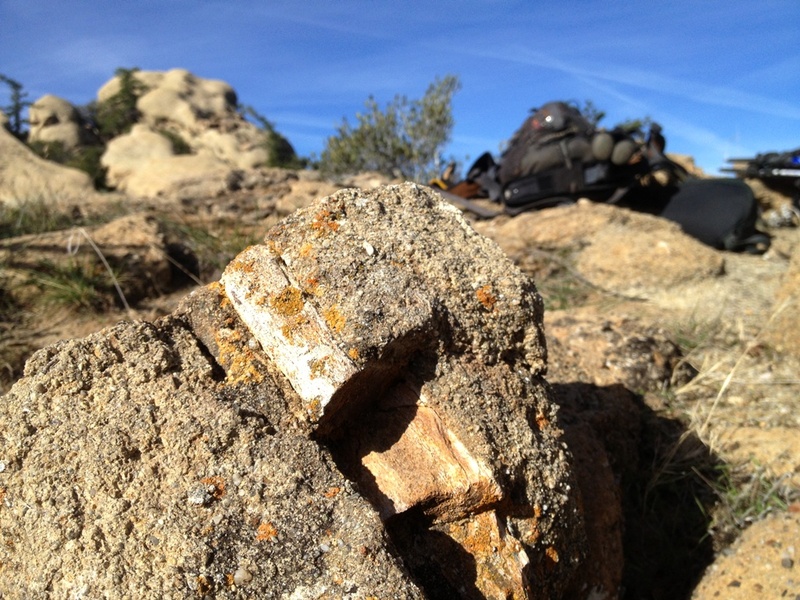 Sometime later Stillman called my attention to a fossilized bone he had found. 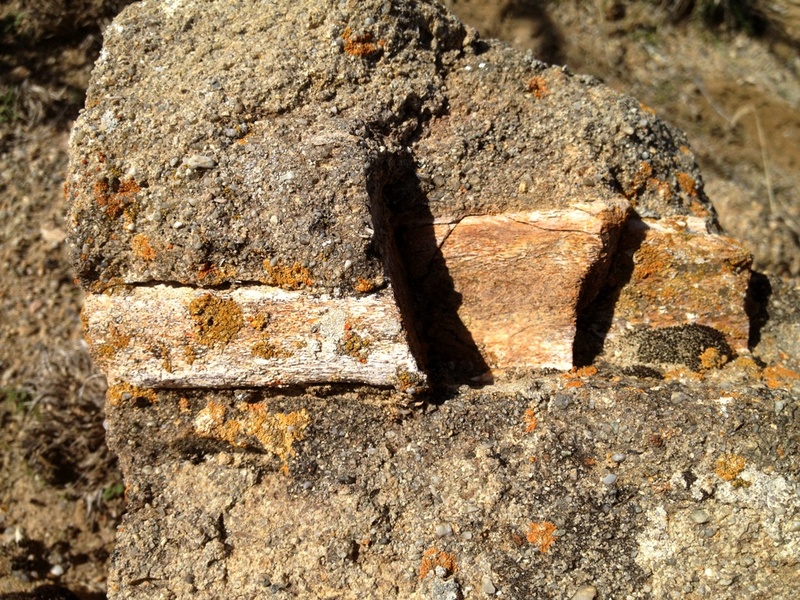 Looking around the area we found several other chunks of fossilized bone. And then came the condors. Circling into view, riding the thermals ever higher, they soared over Whiteacre for several minutes before one of them spotted us a short distance away and came sailing our way. The giant bird flew right over my head offering me the opportunity to capture the leading photo in this post. It then doubled back and landed on Whiteacre Peak where we had been sitting a short time earlier. Following that, the highlight of what would have been already an exceptional day, there is nothing else worth mentioning. And so I won’t. The steep grassy slope we followed up the mountain. San Rafael Peak is visible in the distance on the left. 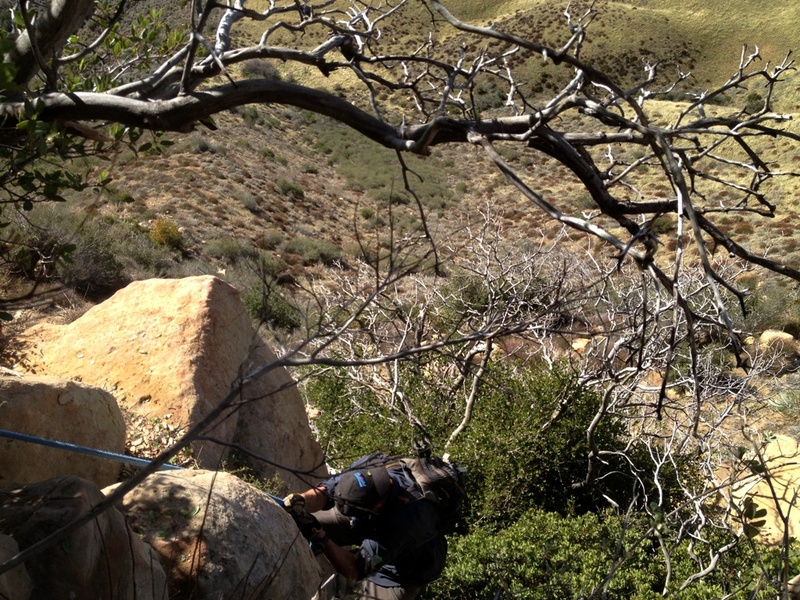 The approach through the potrero to the steep rocky slot with the short rope section. The red arrow notes the slot, which from a distance does not look passable. Stillman making quick work of the rope climb. Looking back over the potrero we crossed. It’s crisscrossed with deer trails and we saw a few bounding about. The deep cleft between the bedrock formations just beside and below the peak. To the right of the chaparral rises another massive wall of sandstone that leads to the summit. The final walk up to the summit showing Stillman looking down into the cleft shown in the previous photo above. Stillman atop Whiteacre Peak with the rocky ridgeline we followed to get there on the right. View from Whiteacre summit. 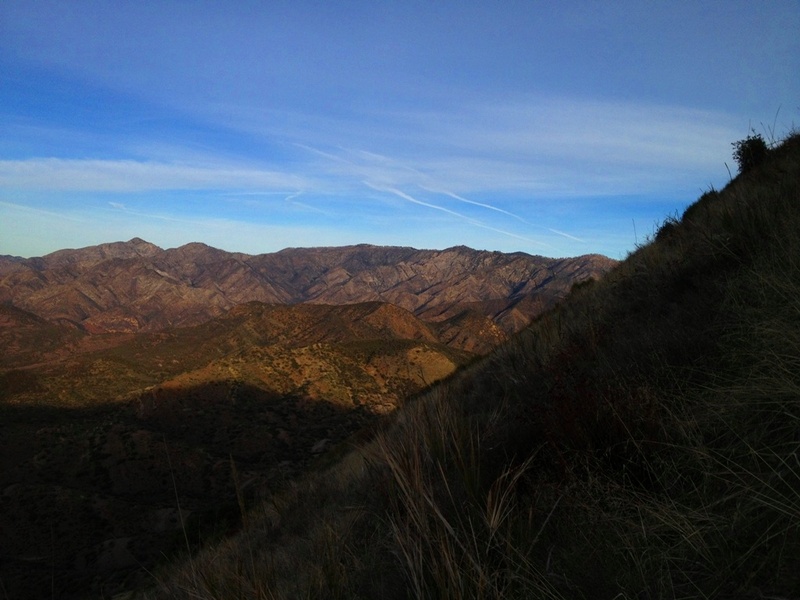 Sespe Trail runs through the lower foreground terrain. 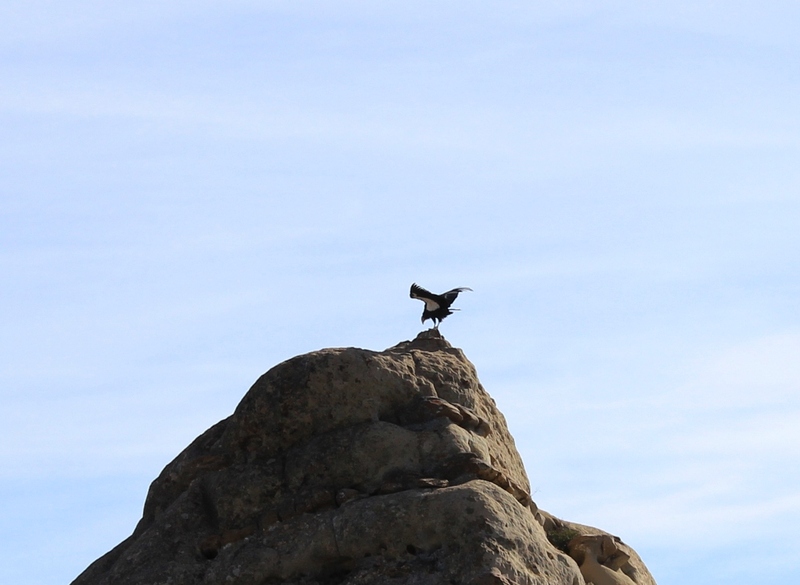 Fossilized bone Condor landing on Whiteacre Peak. 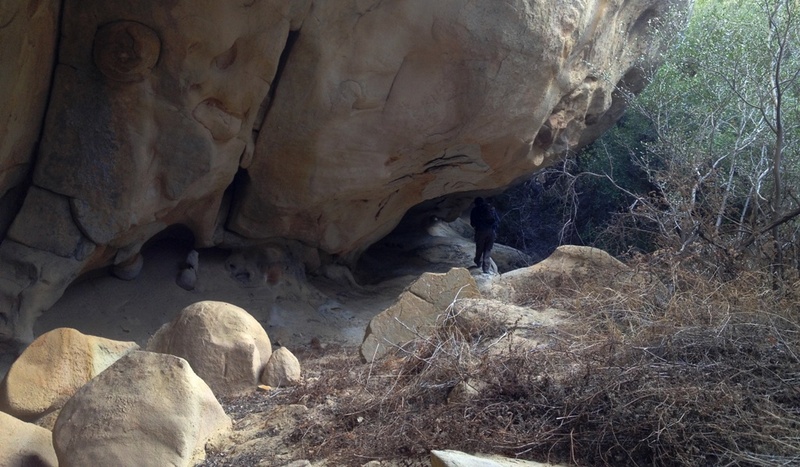 This entry was posted in Ventura County and tagged backcountry, Condors, Fossils, Hiking, Los Padres National Forest, Mountain Lions, Nature, Peaks, Sespe Wilderness, Whiteacre, Wildlife. Bookmark the permalink. Hey Steve. I don’t know the coordinates. It’s located off the end of Goodenough Road behind Fillmore from the trailhead I mentioned. What a treat! All sounds great! Great day hike ! Is there another way up that would not require ropes ? 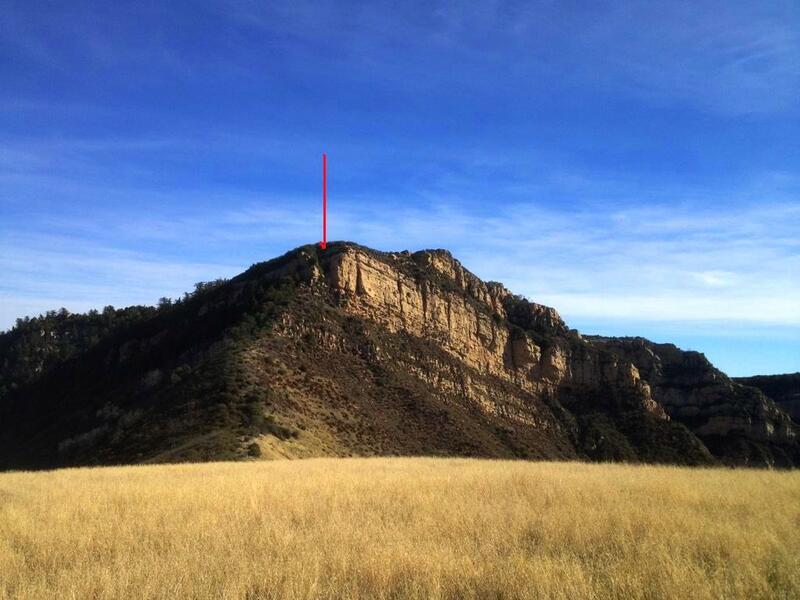 perhaps to the left of the arrow up the ridge ? So far as I know the only way up on top is by way of the rope.